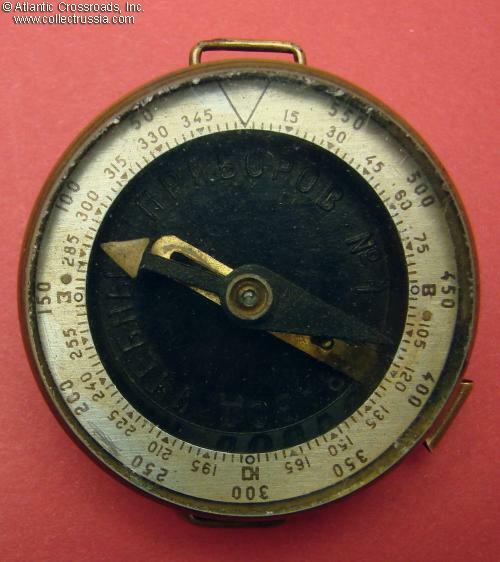 Red Army Military Issue Field Compass, simplified version without the brass sight, dated 1940. Measures 2" in diameter. Bakelite and brass case. 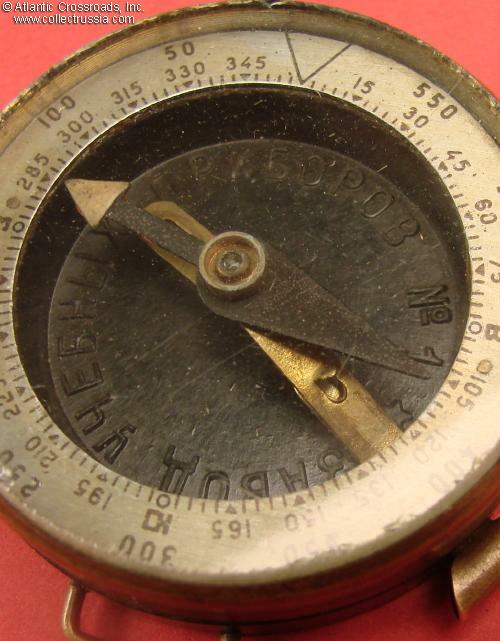 The inside bottom of the dial shows the maker's name in raised lettering, "Factory of Educational Instruments #1" (in the Soviet Union, many ostensibly civilian factories manufactured military equipment, often as their main product). 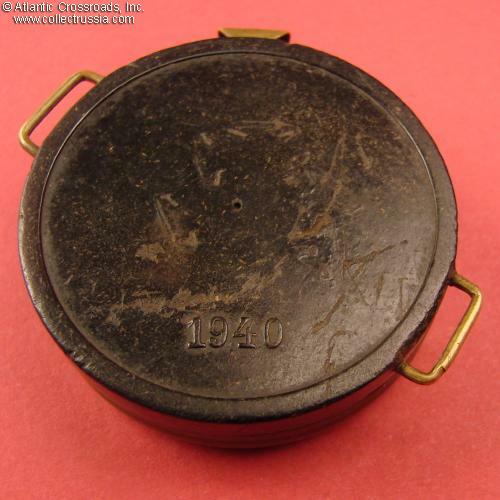 The 1940 date is on the reverse of the Bakelite case, in raised numerals. 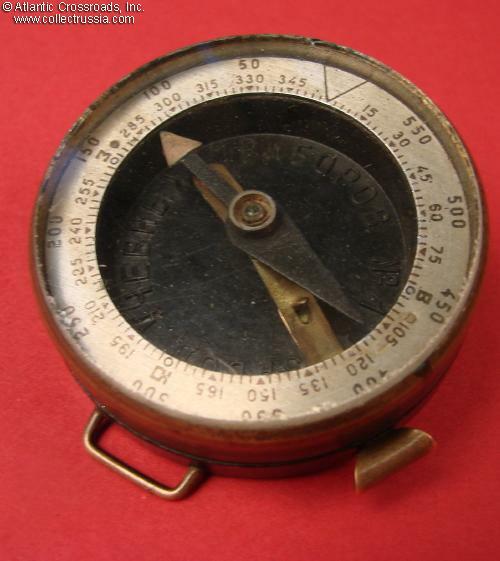 This model lacks the brass sight mounted on the bezel; note also that the brass portion of the case appears to have never had the nickel plating. This simplified version was possibly a wartime expediency: the 1940 date on the back may have stayed unchanged through 1941 or even beyond. Another plausible explanation is that during 1940, as the Soviet war preparations became more hectic and production quotas for military equipment sharply increased, manufacturers were allowed to "cut corners" in order to meet the demand. 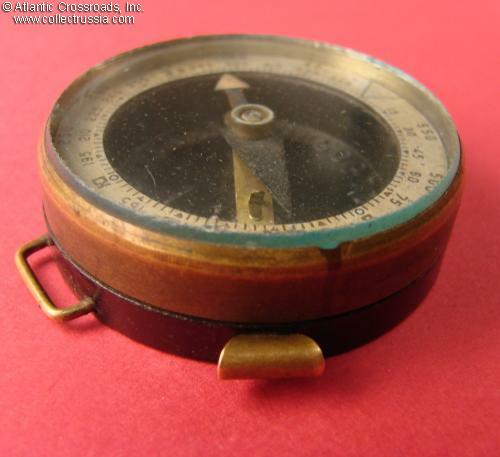 The compass is excellent condition. The magnetic arrow and stopper are still in working condition. The original glass is completely intact and clear, free of scratches or rubbing. There are some dings and scuffs to the bottom of the Bakelite case, not really detractive.